Land contamination arises principally from a wide range of industrial works, mining or waste disposal activities. Neath Port Talbot County Borough has inherited a legacy of such land dating back to when industrial growth began in the 16th century. Following the introduction of Part IIA of the Environmental Protection Act 1990 in July 2001, each local authority has a duty to inspect its area for contaminated land and, if necessary, secure the remediation of historic contaminated sites within their area. 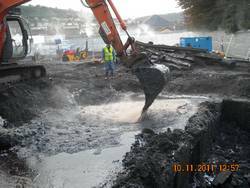 The Contaminated Land Team undertakes these duties on behalf of the Council and has published a Contaminated Land Inspection Strategy. The Council also has a duty to publish a Register of all enforcement action taken under Part 2A. This can be accessed at the Legal Services Department, Port Talbot Civic Centre, Port Talbot, SA13 1PJ. The register is available Monday to Friday during normal office hours, access to the register will be provided free to members of the public although a small charge will be made for photocopying. Arrangements to view the register can be made by contacting the Legal Services Department on Tel: 01639 763345 or via Email: landcharges@npt.gov.uk.